Being a mom with super powers, like Elastigirl from the Incredibles, has got to be pretty tough. When you're not trying to keep Jack-Jack from ruining the house with his new super powers, you'll be breaking up fights between Dash and Violet, or you'll be making sure that Bob sticks to his new healthy diet. Oh, and did we mention that in between all that, you'll be saving the world from the likes of villains like Syndrome. It's safe to say that any girl with all that going on in her life, probably doesn't have a lot of time to worry about costumes! 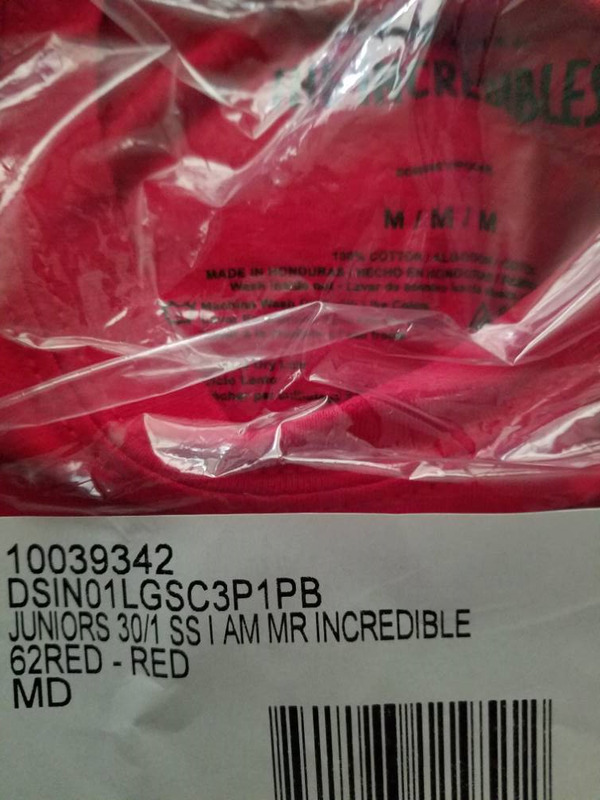 That's why it's a good thing we have this Incredibles Logo T-Shirt! This Juniors t-shirt is a quick and easy way to dress like your favorite superhero from Disney Pixar's Incredibles! It has the signature logo on the front and is made out of a comfy polyester and cotton blend, so you don't have to wear some kind of crazy spandex suit while you be the best superhero mom the world has ever seen. As received label image below, plan to return unopened. 100% cotton, juniors medium. The title of this t-shirt would lead you to believe it's an adult size t-shirt, but it is not. It's definitely a junior girls size. Not even close to fitting.